Lets slow things down a bit. It’s summer after all and really, who can be bothered with cooking? In those heady summery nights when I’m wearing linen trousers, watering my mini garden and bopping along to Len’s ‘Steal My Sunshine’ I struggle to find the motivation to cook. Heck I sometimes struggle to find the motivation to sit down and eat a meal and THAT is saying something. Autumn is my hibernation zone but in Summer I become a grazer. So weekend dinners often become a thrown together Mezze. Nothing fancy mind, this is not the time to be stuffing figs and wrapping things in parma ham. We’re talking nuts, mini pork pies, cheese, crackers, olives, crusty bread and maybe a pile of potato wedges flung in for good measure. The highlight of which is the alcohol of course. No summer evening is complete without some. To be frank, it doesn’t matter WHAT you dish up for your tea, if the drink is good, who really cares? It’s that laid back attitude that I love about summer. So lets have a chat about Pimms. Us Brits love Pimms, we can’t get enough of the stuff. As soon as summertime rears its head (read: the thermometer hits 16C) we are off slicing our strawberries and cucumber with gusto. Even us up in the Weeg can be seen poshing it up as soon as its Taps Aff weather. Our obsession with Pimms is 1 part patriotism and 2 parts appreciation of a refreshing beverage which doesn’t get you too drunk when spending an afternoon in a beer garden. So in light of the political climate I throw caution to the wind and celebrate my Britishness by upping the ante on the classic Pimms cocktail with a Pimms Iced Tea. A drink which celebrates our two favourite national drinks. Typically us Brits like our tea hot, in a mug with lashings of sugar and milk. Good old builders tea. The drink you can wrap your hands around on a cold day and savour the insulation it brings. It’s because of this we struggle to get our head around the American oddity of iced tea. 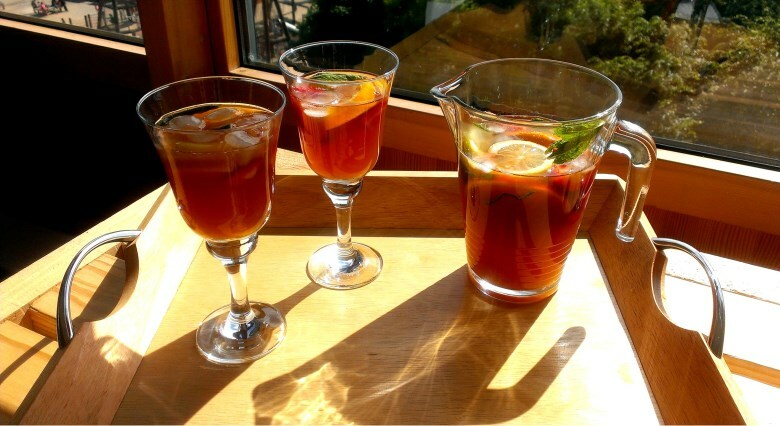 The addition of tea to the Pimms cocktail is to replace the ginger ale or lemonade so you end up with a non-fizzy version. So you can make several jugs of this stuff in advance and not have to worry about it losing its fizz. 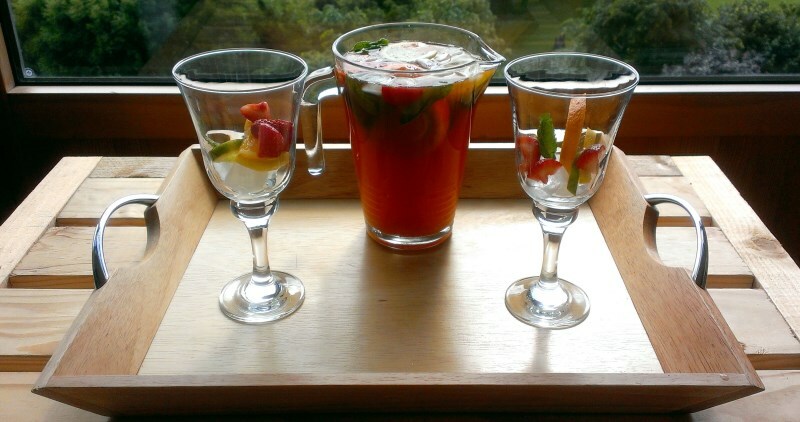 Depending on the tea you use, you can also introduce a range of flavours to the cocktail. I like to use Earl Grey which already has a light floral citrus flavour but you can use any tea you have lying around. Try Twinnings or Teapigs for some inspired flavours. This recipe comes from my ever expanding collection of Good Food magazines to which I’ve made minimal changes. You will get approx 4 glasses from this recipe but feel free to double or triple the quantities if you have a large enough jug. In a large jug, add the teabags, mint & 750ml hot water from the kettle. Leave this to infuse for 10 minutes. The British neat and ordered way of preparing cocktails. Remove the teabags & mint from the jug using a slotted spoon and discard. Stir the sugar into the hot tea until dissolved and leave to cool before putting in the fridge to chill. If this process takes too long for you, pop the jug in the freezer and it should be chilled in 20-30 minutes. Meanwhile, cut the fruit into slices and keep in the fridge until ready to use. 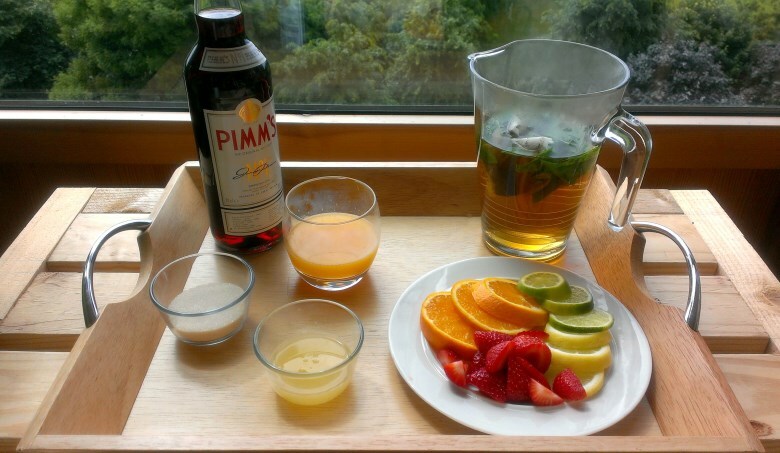 Once the drink is chilled, add the orange juice, lemon juice, Pimms, sliced fruit and the remaining mint leaves. Cram as much ice as you can fit into the jug and mix. Serve in glasses over ice. Now kick off your espadrilles, sink into a deck chair and enjoy the British summertime while it lasts. Haha! I’ve noticed we’re getting some sun but only on weekdays, not good for a Pimms at all!